There are many uses for this type of metal detector. Food processing, wood machining, post room security, animal feed screening, quality control, clothing manufacture. Counting metal items, there are many more. Although such detectors are available commercially, the cost of such equipment can be prohibitive ( several thousand pounds ) especially for the small business or entrepreneur. 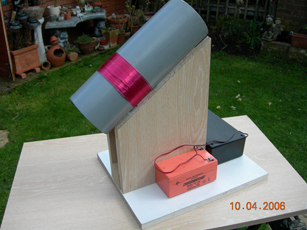 To build this detector you will have to purchase a ready assembled and tested circuit board that is only available from us. 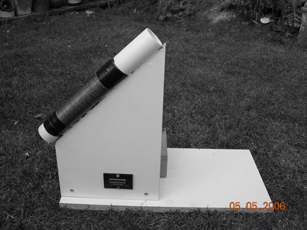 the cost of this board including postage to anywhere is £130.00. Purchasing details are at the bottom of this page. 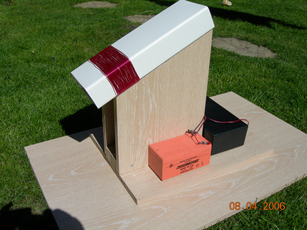 This type of detector is called an aperture type and will consist of some sort of construction that is made entirely of wood or plastic, and must contain no nails or screws. 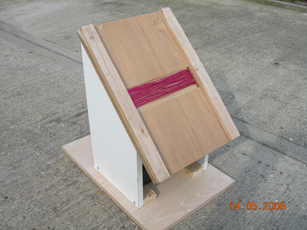 The device above is made from 10mm plywood that has been screwed and glued. The screws being removed when the glue has set. The actual aperture can be any shape and size you like within reason. Some more examples are shown below. It is important to make the aperture no bigger that you need for your particular application as the bigger the aperture the less sensitive to small objects. The board is supplied with a length of 0.7mm 22swg Copper Enameled wire that is the correct length ( 22.5 meters ) to make one coil. You use the same length of wire whatever the diameter or shape of the aperture. The aperture can be any shape you like but round or square will be suitable for most purposes. The features of this board are as follows: The board operates on the pulse induction principle. The output is by a small speaker 8 ohm ( supplied by you ) and three separate SPCO relays. Each relay has two adjustments for delay after trigger and on time. These delays are from 0-30 seconds. These relays can drive motors, solenoids, valves, flashing lights, or other relays. Whatever you like. 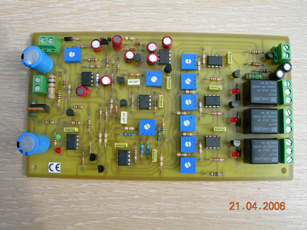 The relays or other parts of the board must never be connected to Mains Voltages. 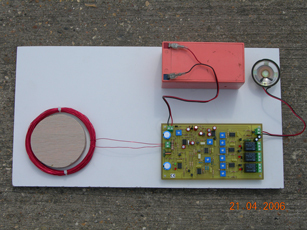 The board can be powered from a battery 2 * 12v gell type or from a suitable wall socket mains transformer. The power requirements are 15-24 volt DC 500ma. The board in standby consumes about 150 ma, this rises to 450 ma with all three relays energized. All connections are made to the board by screw connectors so no soldering skills are necessary. 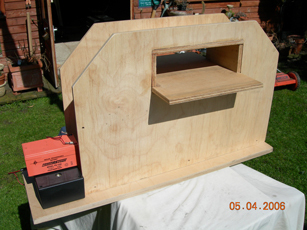 You will also need a small plastic box to put the circuit board in. You have to buy the circuit board from us. We do not sell to dealers agents or middlemen. The price for the board ( assembled and tested ) with copper wire for one coil is £130.00 Plus postage to anywhere in the world. We accept payment by Cheque, Money Order, Paypal or Cash. Make payment to: DAVID SMITH. ( must be in Pounds Sterling ). As long as we get the money some way you will get the board. If sending cash don’t send coins. Notes will do nicely. Paypal is rapidly becoming the easiest and safest way to pay for items like this on the internet. You can pay using your credit card via Paypal even if you don't have a Paypal account. Customers from outside EU should make sure such items are allowed in their country. Any customs label will be marked "sample of merchandize". We have been selling metal detectors from this address since 1977 and have no plans to move at the present time. If you want the board you have to trust me at some point. Please read these instructions a few times before you start with the board. To begin with there are three connections to consider. 1. The coil connections. 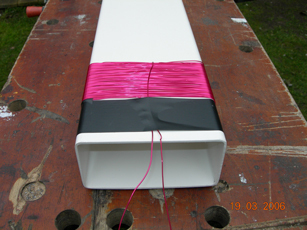 The board is supplied with 1 coil of wire that is the correct length to make one coil. This is Copper Enameled wire is .7mm or 22 SWG diameter and 22.5 meters long. 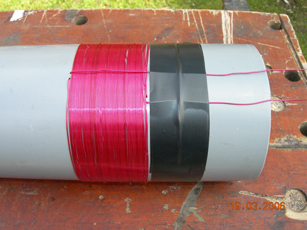 Should you decide to experiment with different coil arrangements, which in a very good idea, a reel of this wire can be purchased at low cost in most areas. You always use the same length of wire. Make sure that the ends of the wire are scrapped clean of Enamel before connecting to the board. The coil of wire we supply will have the ends cleaned and tinned and will be the coil that we use to test the board before dispatch. 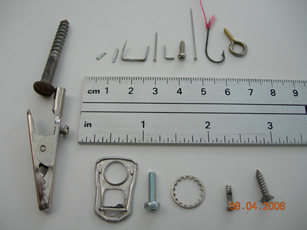 When tightening the screw terminals grip the plastic connector body between your finger and thumb as you tighten the screws. Coils can be soldered directly to the board for reliability. 2. The power supply. This needs to be 15v dc. Over 20v dc will damage the board. In the bottom left hand corner of the board there is a Red and Green LED. From about 11.5 v dc and up the green LED will be on. Below 11.5v dc the Red LED will come on. Below 11.5 v dc the board will not function properly. A 12v gell type battery will give a smooth and fairly constant supply but has the disadvantage of needing to be recharged. You may want to use a 12v dc wall socket power supply for continuous use. Make sure it is a well regulated supply. A 15vdc 500ma supply that is unregulated could give an output that is as high as 16v when connected to this board when it is in an un triggered state, just drawing 135ma. The smoother the power supply the less false alarms. 3. The speaker. This needs to be 8 to 64 ohms about 50mm diameter. The output from this will not be very loud. But is sufficient for most uses and for setting up. Should you need a louder alarm you will have to connect an external buzzer/siren/flashing light to one of the relays. Powered by an separate power supply. The relays. There are three single pole change over relays that are suitable for currents up to 3Amp resistive load. At 24v dc. Voltages above this should never be connected to the board. The relays each have two adjusters. The delay from when metal is detected 0-30 seconds to when the relay is turned on, And a second delay 0-30 seconds to when the relay is turned off. Relay three and the audio tone work together. At the end of relay three/audio delay. The board does a reset ready for the next event. To begin with make a test setup as in the picture above so that you can experiment with different shapes and sizes of coil. And reaction to different types of target. Coils. Unless you know a lot about Pulse Induction coils it will be best to begin with to stick to the wire diameter and length as above. The general rule with metal detector coils is that the larger to coil diameter the less sensitive to small objects. The shape and size of your coil will depend on you needs but try to make the coil just bigger than the items you are testing. 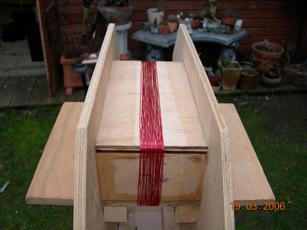 On the slide down tube detectors as pictured above it was found that a layer wound coil gave the detector more time to react. Although a bunch wound coil may be more sensitive to small objects moving slower. Experiment! Experiment! Experiment! Operation. With this type of detector it is most important that when it is switched on, that the coil is well away from any metal. At switch on the board does a self test and recalibrates it self. If there is any metal near to the coil the board will be reset incorrectly. Each time there is an event ( metal is detected ) the board does a reset ready for the next event. The reset takes place immediately after the end of the audio tone. At this time any metal target must be clear of the coil. Adjustments. There are nine adjusters on the board VR1-VR9. These are single turn Cermet 100K linear. And there are four test points TP1=Red= Battery Positive : TP2=Black= Battery Negative: TP3 Yellow = IC1 offset null adjustment: TP4=Green= Trigger level. VR1. This sets the offset null for IC1 the low noise pre amp NE5534. We set this at testing and under normal circumstances this not need to be readjusted. If it does ever need to be adjusted. Using a reasonable quality Digital Voltmeter connected to TP1 Red and TP3 Yellow adjust VR1 slowly to obtain a reading as close to 0V as possible. VR2. This sets the output level from IC2=TL062 and like VR1 this control is set by us at testing and should not need to be readjusted under normal use. Should this control need readjustment. Connect the voltmeter Black lead to TP2=Black and TP4=Green. Slowly adjust VR2 to obtain a reading of +3.5 volts. Adjustments to VR1 and VR2 would never need to be more that a few degrees either way. VR3. This control sets the sensitivity of the board to metal objects, and is set by us at testing to about three quarters to maximum. In most cases it will be desirable to set this control to maximum to obtain the best sensitivity. This control can be set by the operator to suit there particular needs. Anti Clockwise= less sensitive: Clockwise=most sensitive. It may be sometimes beneficial to carefully unsolder this control and replace with a panel mounted Potentiometer 100K linear. Why adjust sensitivity. When looking for metal in food, wood, plastic etc, where there can be harm to people, customers, or machinery it is obviously an advantage to have the detector set to maximum. But in an electrically noisy environment such a factory shop floor, where there are lots of electric motors, relays, radio equipment etc many false alarms can become a burden. In such environments a lower sensitivity may be necessary to avoid false triggering of the detector. In some cases for example. Using the detector to count quite large pieces of metal on a slide down chute or tube. The lowest level of sensitivity may be sufficient. VR4-VR9. VR4 adjusts the delay from the time metal is detected ( an event ) to the time Relay 1 in energized about 0-30 seconds. VR5 then adjusts the on time for the Relay 1. Again about 0-30 seconds. VR6-VR7 serve the same purpose for Relay 2. VR8-VR9. Serve the save purpose for relay 3 and also the audio alarm via a small speaker. It is important to remember. That at the end of the audio tone the board does an onboard reset and adjusts itself ready for the next event. it is most important that at the end of the audio alarm no metal is influencing the detector coil. In most cases it would be advisable for the audio tone to finish last. Delay Adjustments. The delays from VR4-VR9 increase as the controls are turned clockwise. False Triggering. It should always be born in mind that the board can be triggered by external events, especially at full sensitivity. 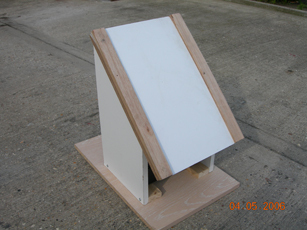 During development of this board we set up a test situation and false triggering was extremely rare. But in can happen. No system is perfect. It is most important that safe operating procedures are observed when using this product. Make sure that no motor, relay, or other actuator or live wire is being adjusted or touched while the board is active. It can false trigger at any time should always be in mind. VR3-VR9 can be carefully unsoldered using de solder braid. The solder on this board is non lead to comply with recent legislation and needs to be heated a bit more than solder containing lead that you are familiar with. Avoid overheating the board and damaging the pads. These controls can be replaced with panel mounted Potentiometers. 100K linear via flying leads. LEDS. 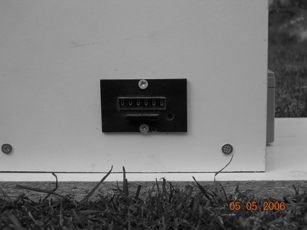 There are five LED's on the board, and these could also be removed and panel mounted , but polarity must be observed.